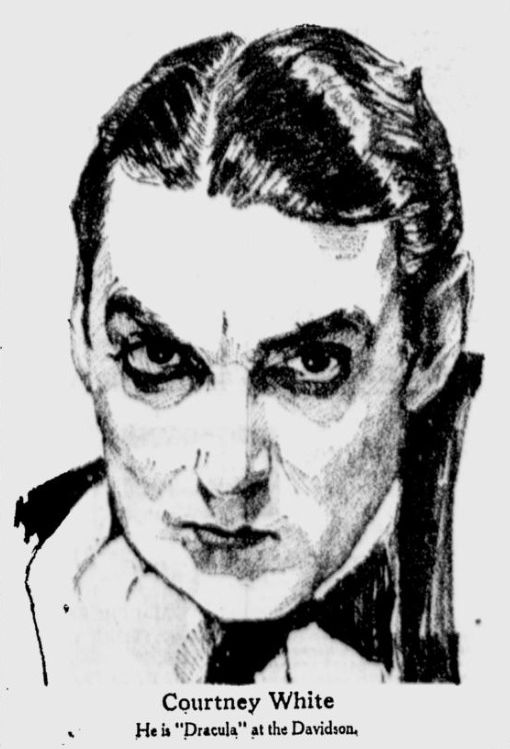 Courtney White made his Broadway debut in the 1918 revival of Experience at the Manhatten Opera House. 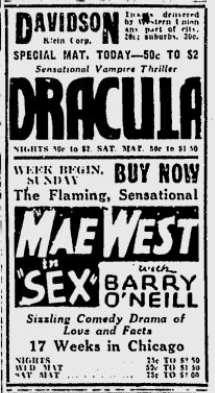 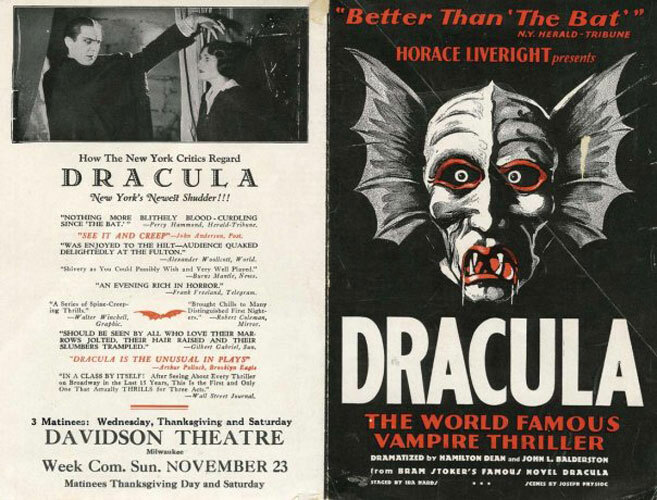 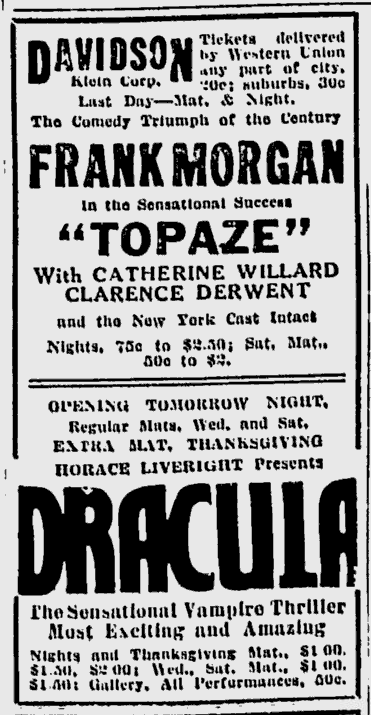 Among his ten other Broadway credits was the title role of in the short-lived 1931 revival of Dracula at the Royale Theatre. 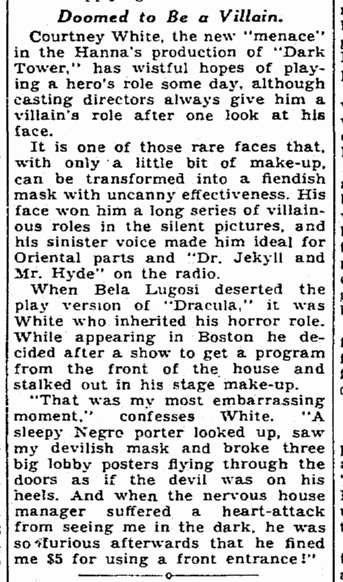 In addition to his roles in on the stage he appeared in silent films and radio, including a production of Dr. Jekyll and Mr. Hyde. 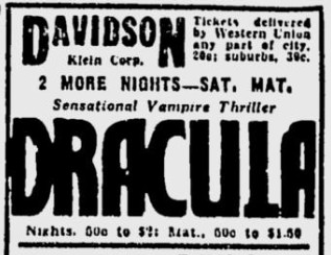 “Dracula,” most sensational and most enduring of all the mystery dramas, returns to Boston Monday evening, this time being on view at the Lyric Theatre. 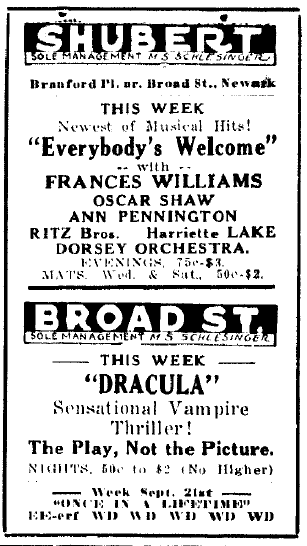 That it always has been popular entertainment here is indicated by its various previous engagements. 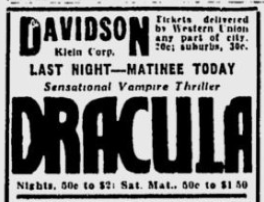 The story of a vampire in human form which roams the countryside from midnight to dawn, leaving terror in its wake. 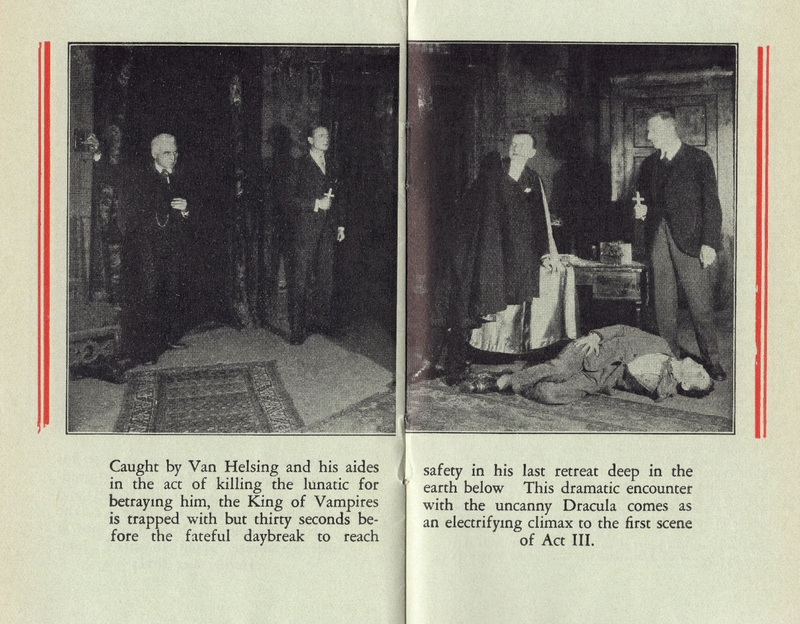 Hamilton Deane and John Balderstone made the now famous dramatization from the rambling narrative by Bram Stoker. 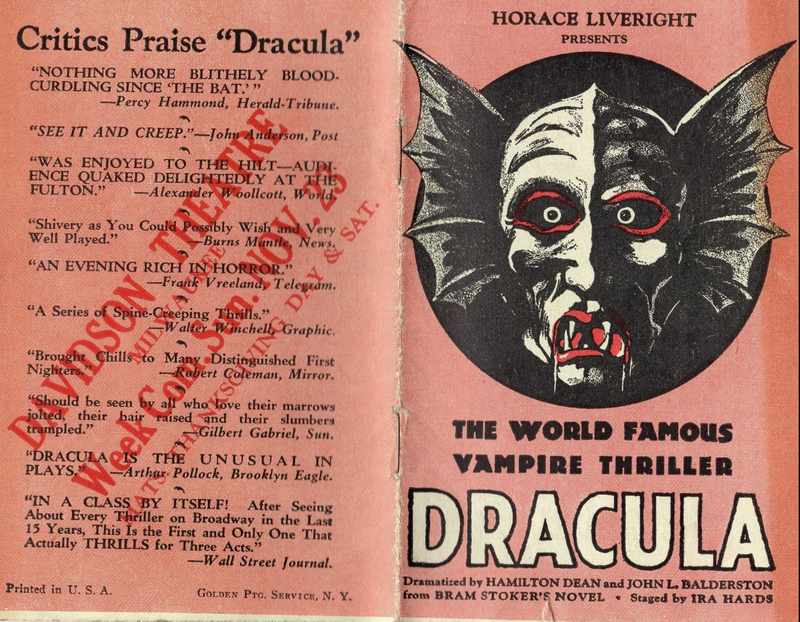 The novel has thrilled book readers for two generations. 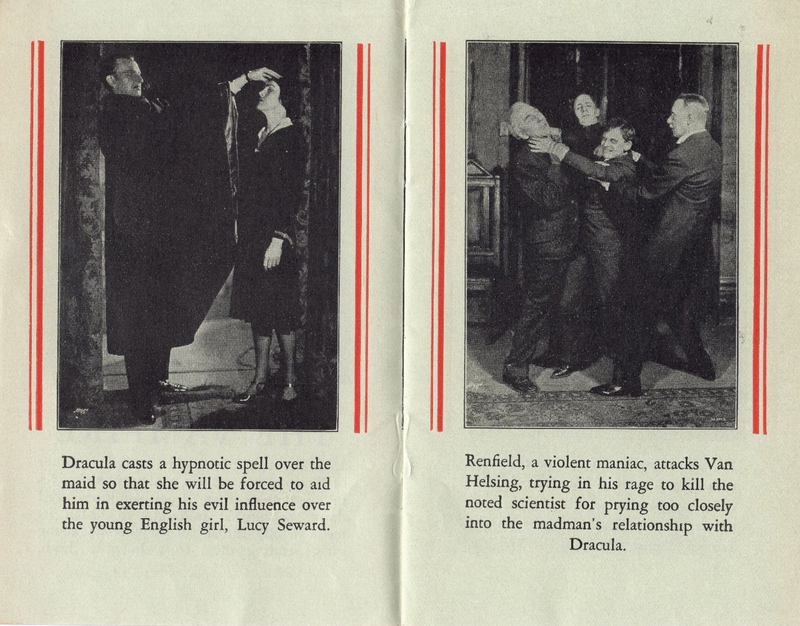 The play is now in its fourth year in England. 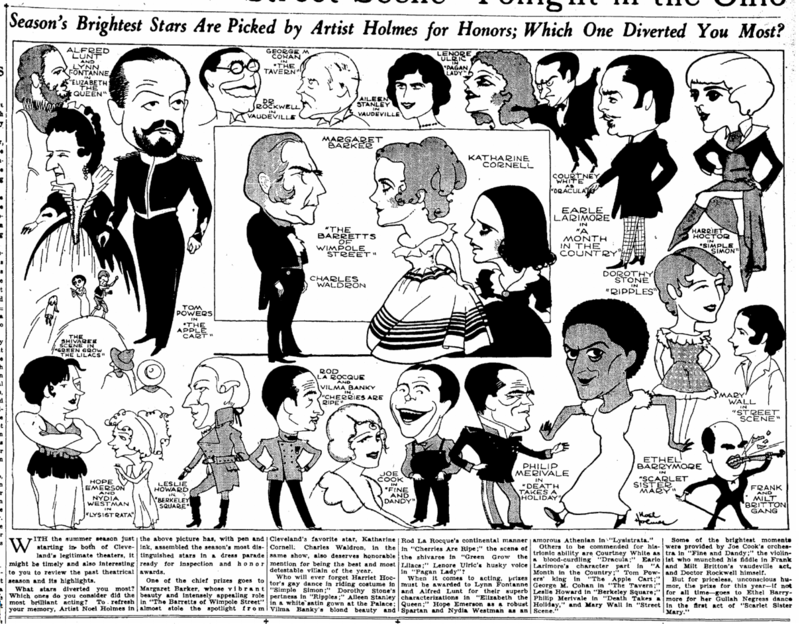 The present cast in Horace Liveright’s production includes Courtney White, Edward Forbes, Marcella Gaudel, William Melville and Alfred Sill. 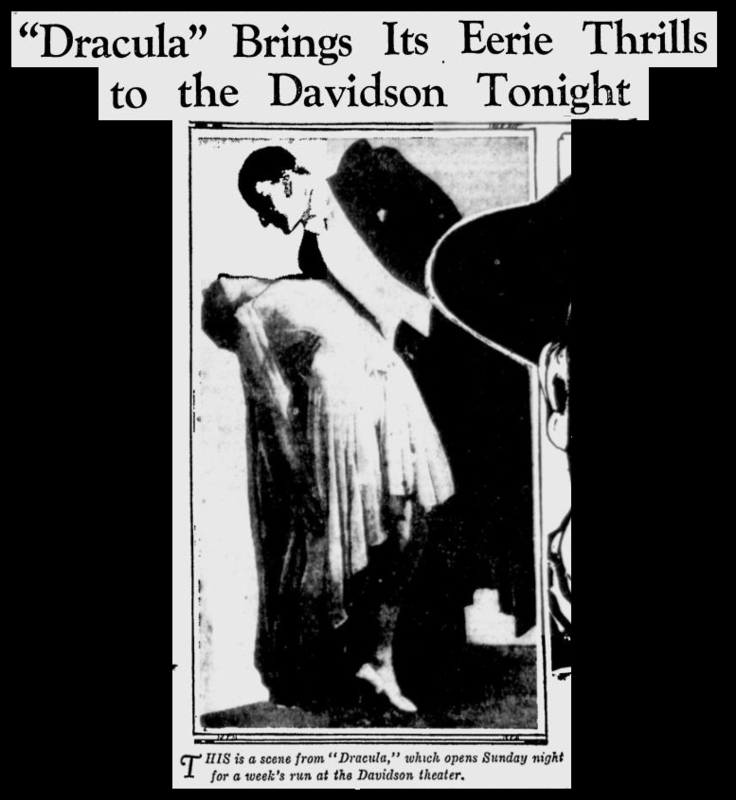 “Dracula” is based on a strange superstition that lurks in certain countries of middle Europe, relative to ghostly vampires – beings of an ether world who exist on a sanguinary diet, secured by drawing the blood from the necks of their victims. 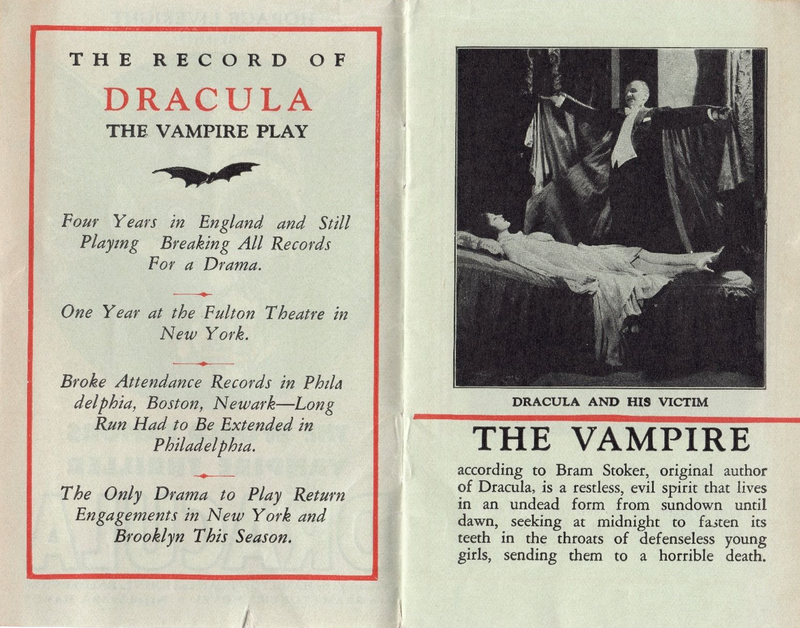 In the old legends they were supposed to prey on human kind, and to go on existing for centuries by virtue of their predatory activities. 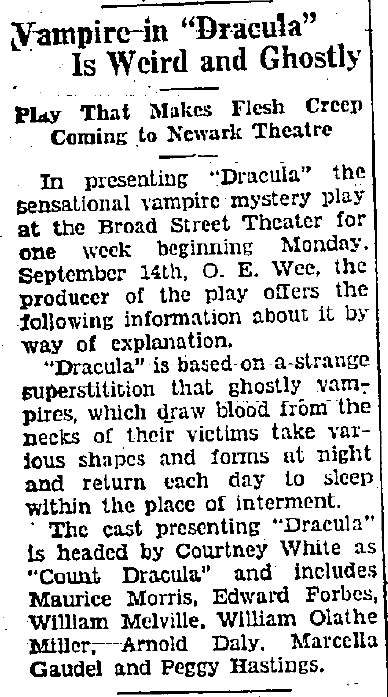 Mo vampire actually died but remained an animate corpse, taking various shapes and forms at night and returning each day to sleep within the place of internment. 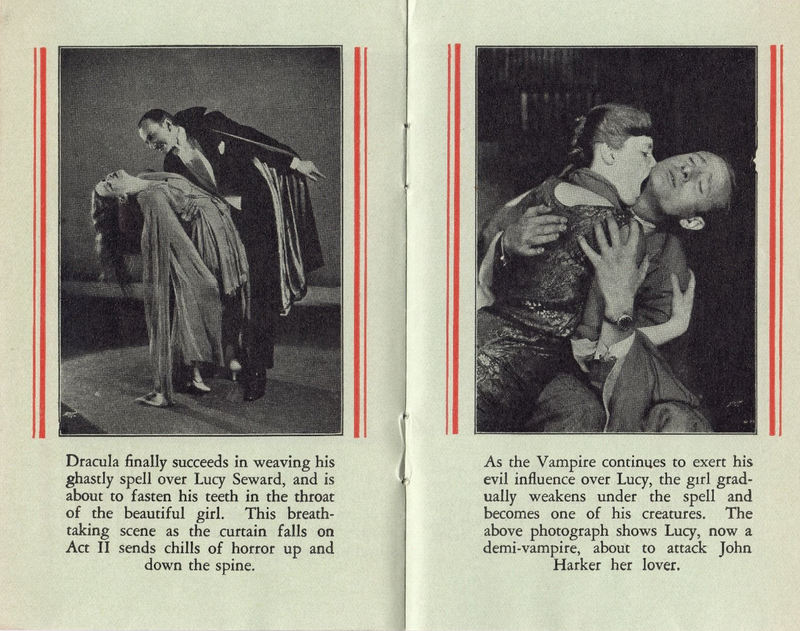 With this foundation the plot of “Dracula” revolves around an English girl who has come under the sinister influence of the titles personage, “Count Volvode Dracula,” a suave Hungarian diplomat. 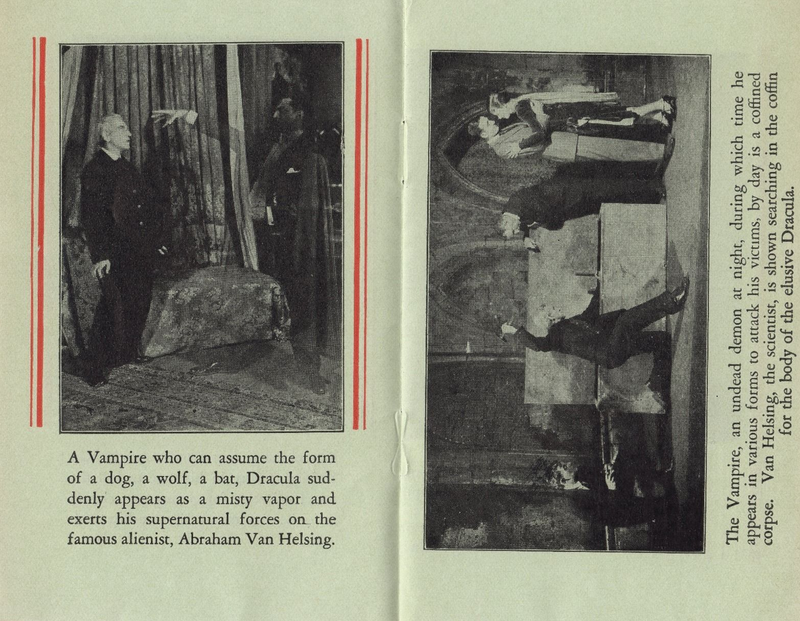 The machinations of “Dracula,” who assumes at will the form of a were-wolf, a howling dog, a flapping vampire or a mist, and to whom walls, doors and windows form no obstacle to his entry and exit, are foiled by the Dutch scientist, “Professor Van Helsing,” versed in ways of necrology. 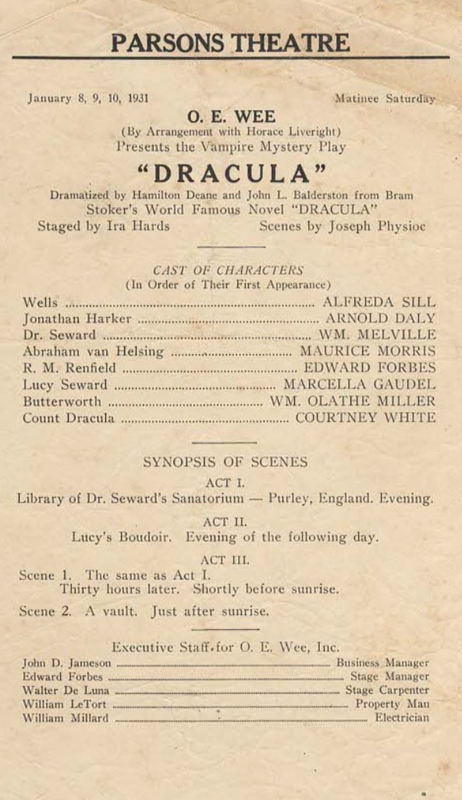 The cast presenting “Dracula” is headed by Courtney White as “Count Dracula” and includes Maurice Morris, Edward Forbes, William Melville, William Olathe Miller, Arnold Daly, Marcella Gaudel and Peggy Hastings. 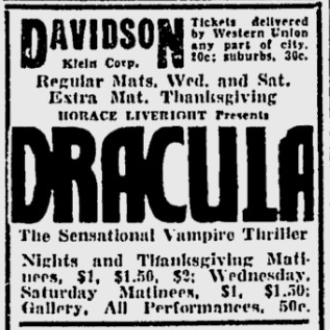 Regular matinees today and Saturday will be given.